100% wild-caught fillets char-grilled and expertly seasoned. 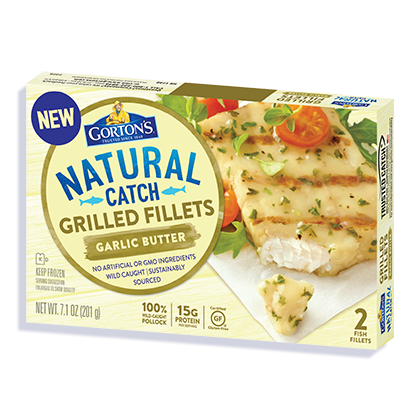 The only thing you’ll taste in our Garlic Butter Grilled Fillets is char-grilled fillets expertly seasoned with real garlic and butter. There are no artificial ingredients, no GMO ingredients, and no artificial colors—just naturally delicious fish. There’s nothing artificial in the wild, so there’s nothing artificial in our Natural Catch. UNCOOKED. KEEP FROZEN UNTIL READY TO COOK. Remove fillets from pouch before cooking. 1. Place fillets, seasoned side up, on a microwavable plate and cover loosely. 2. Microwave 1 fillet on HIGH for 3.5 to 5.5 minutes*, or 2 fillets for 6 to 8.5 minutes*. 3. Rotate plate during cooking. Caution: Plate may be hot. Water, canola oil, nonfat milk, sea salt, corn starch, dried garlic, spices, butter (cream, salt), cane sugar, parsley, natural flavor.